My husband’s granddaughter got married this weekend. It was a lovely day with a touching ceremony, a delicious celebration dinner, lots of visiting and joyful dancing. 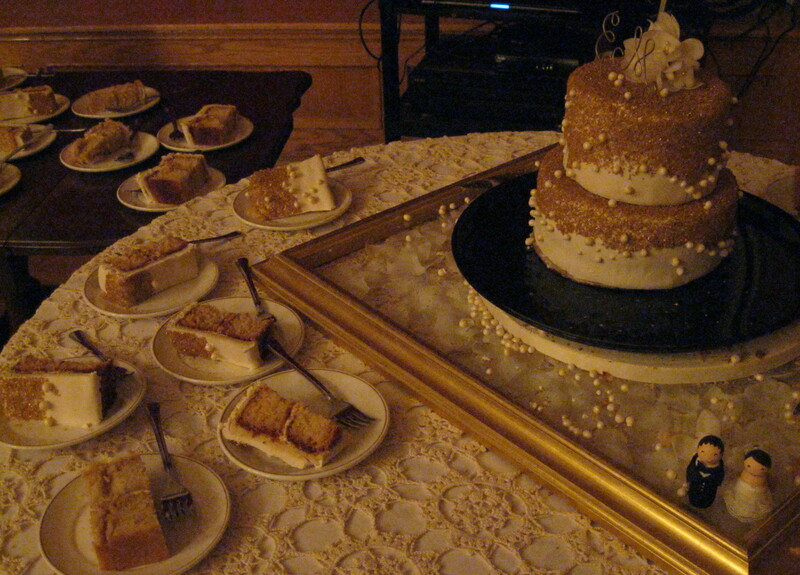 My contribution to the festivities was to bake and decorate the wedding cake. I had lots of time over the summer to test recipes. This is the final version that I used to make all the layers of the cake. Beat for two more minutes at low speed, scraping bowl once or twice. Divide batter into two prepared 8″ layer pans (use parchment paper or grease and flour). Bake at 350 degrees F for about 30 minutes. Cool five minutes in the pans then invert onto cooling racks. 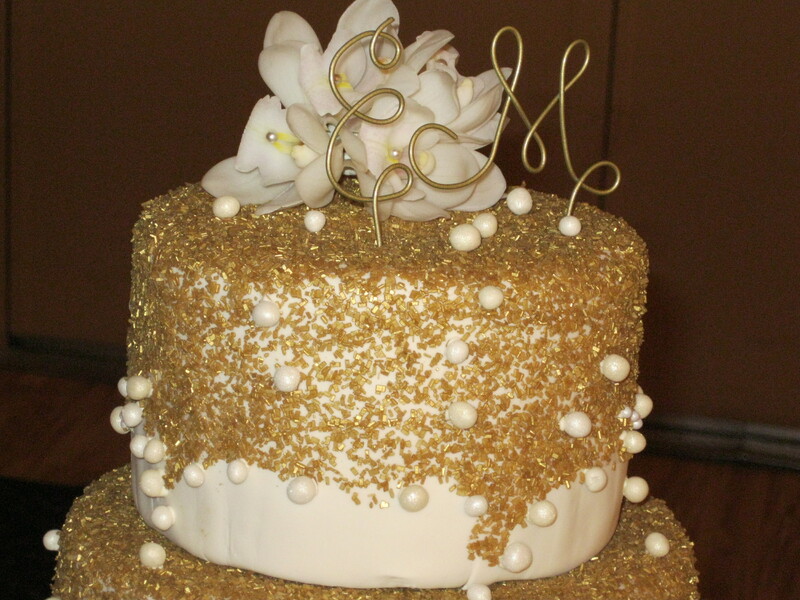 When it was time to assemble the cake, I used vanilla buttercream to fill each layer, then covered them in almond paste, followed by fondant for the icing, and finally, I added colored sugar crystals and pearls handmade from fondant as decorations. 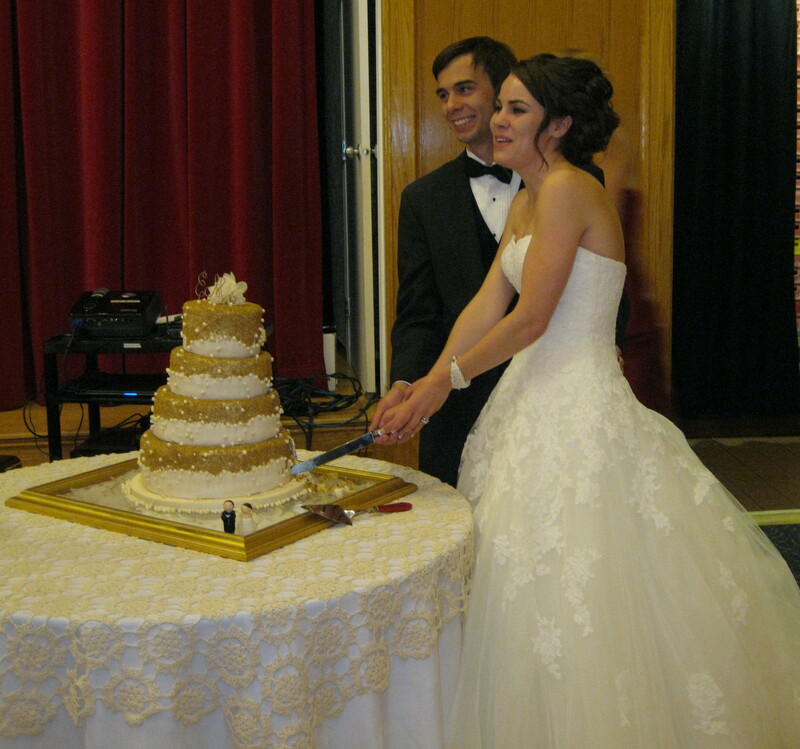 My son was recently married, so now we have a new daughter (in-law)! I made the wedding cake. 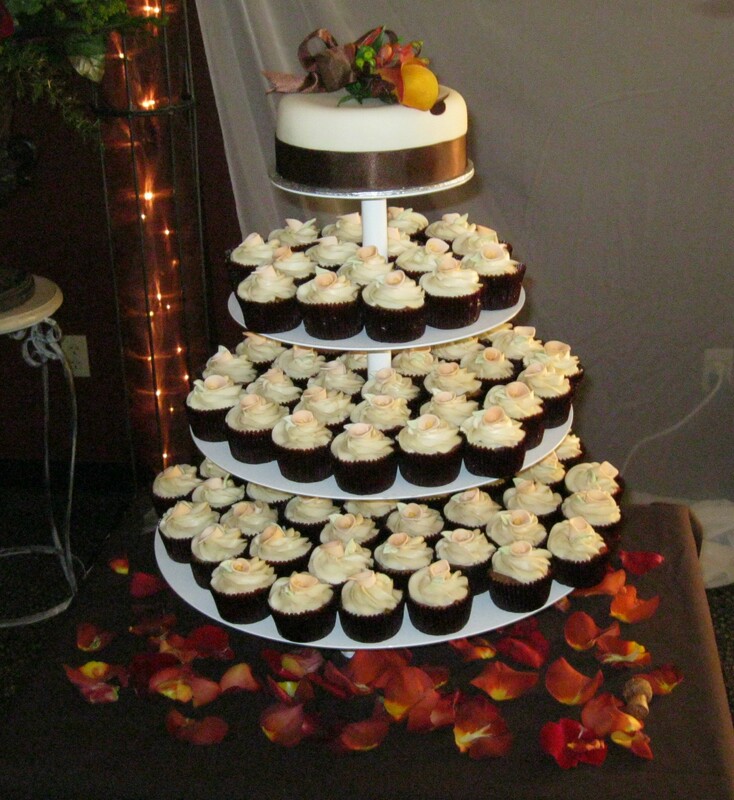 The bride asked for cupcakes with a small cake to cut into for pictures. She’s a fan of carrot cake, so that made it easy. 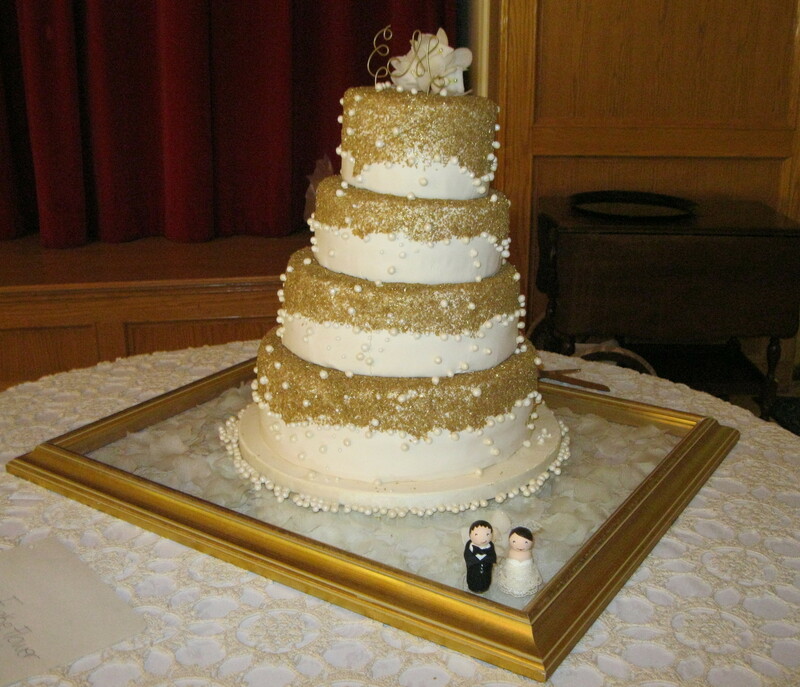 Carrot cake is a nice firm cake, very well suited to the extra handling that comes with wedding cakes. This is my refined version, I’ve reduced the sugar, fat and eggs significantly from the original recipe, but it hasn’t lost anything, except some calories! In a large bowl, combine the dry ingredients. In a separate smaller bowl, stir together eggs, oil and milk. Make a well in the dry ingredients and add the wet ingredients, stirring (use a folding technique) just to combine. Pour batter into greased and floured pans and bake for about 30 – 40 minutes till golden brown. This recipe will make two 8″ layers, OR about 18 large cupcakes OR a 6″ x 3″ round layer pan (which is what I used for the wedding cake). 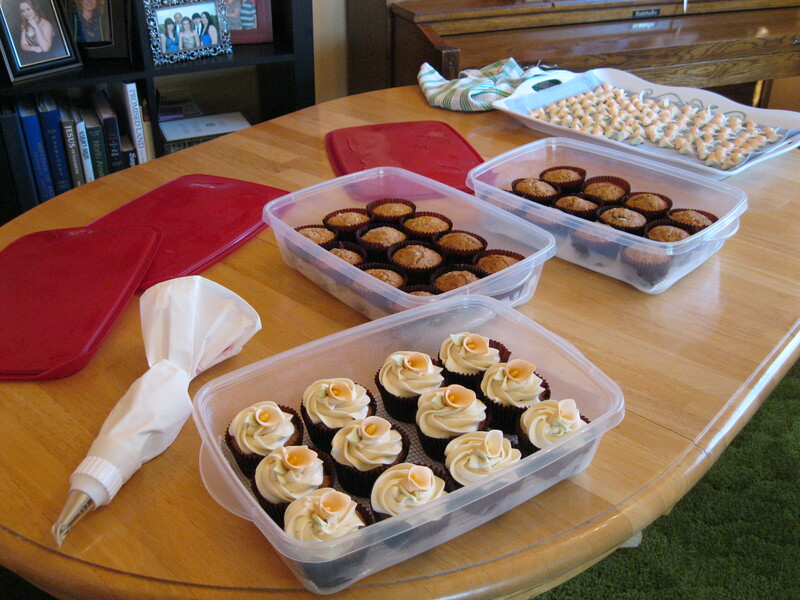 The cupcakes were decorated with cream cheese icing, and the little cake with fondant. Beat together cream cheese and margarine. Add flavors and glycerine, if using. 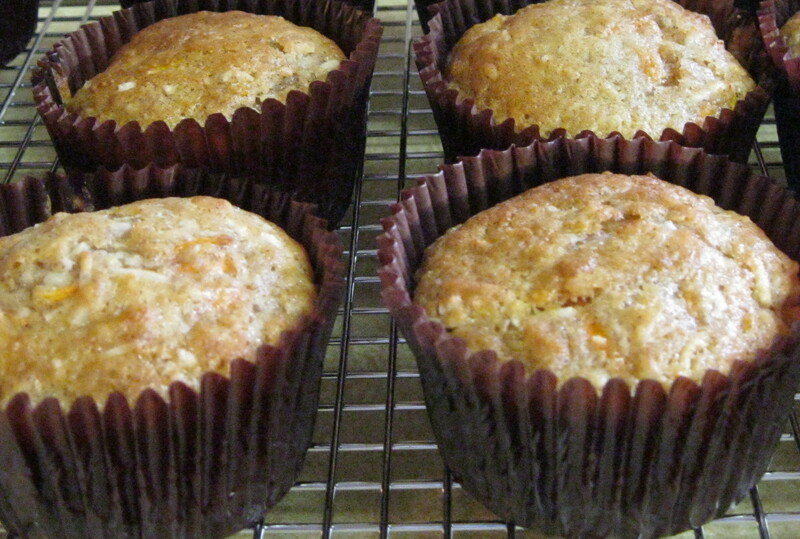 Gradually add icing sugar, mixing well after each addition. Icing may be thinned, if necessary, with a small addition of corn syrup.